Motilal Oswal, Chairman and Managing Director, Motilal Oswal Financial Services, talks about the market direction and the stocks to pick. Is the steep rise in the equity markets justifiable or do valuations seem stretched? While it appears that the revival of the stock markets between October 2008 and March 2009 has been too fast, adjusting for the impact of the general elections in May 2009, the Indian markets have performed broadly in line with other emerging markets. It is possible that valuations are stretched. In January 2009, the Sensex was trading at a one-year forward PE of 11x. Since then, there has been a 60% PE rerating to the current levels of 17x. This is 20% above the long-term average multiple of 14x. With the earnings growth in 2009-10 expected to be flat, the re-rating in Sensex valuations reflects market expectations of strong earnings growth in 2010-11. Our estimates show a healthy 26% earnings growth, given the low base effect. Economic growth will remain slow at least for the next two quarters due to poor monsoons. However, our analysis of the previous drought years suggests a strong economic and stock market recovery in the year succeeding the drought year. In fact, after the last drought year (2002), the Indian markets witnessed a five-year bull run. Should one invest in equities at present? Successful investing is not about timing, but time period. Buy a stock that you believe is undervalued, then wait till the market realises its folly and re-prices the stock according to its value. The value-price realignment could happen quickly or it could take a very long time. Should small investors look beyond large-cap stocks? How can they identify a good small- or mid-cap stock? Winning ideas can be found across companies. Today’s large companies began as small ones. In a letter to the shareholders of Berkshire Hathaway in 2007, Warren Buffett wrote on ‘Businesses—the Great, the Good and the Gruesome’. A truly great company, he wrote, must have an ‘enduring moat’—long-term competitive advantage— which protects the returns on invested capital. This is possible only if it is a low-cost producer or possesses powerful brands. Great companies tend to grow slowly, but they consume little additional capital. Over time, these become significant cash machines with steadily rising return on equity and high dividend payouts. Good companies grow at healthy rates but need large amounts of capital to sustain growth. Compared to great companies, their return ratios tend to be much lower, as do dividend payouts. Gruesome companies require significant capital for such growth and earn little or no money. Paradoxically, such companies have very high growth rates, which turns out to be a trap. 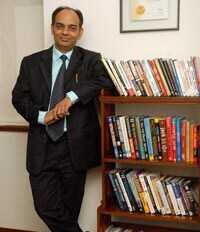 The Motilal Oswal’s 13th Annual Wealth Creation Study, released on 19 December 2008, identified Hero Honda as a great company available at a good price. In the nine months ended 30 September 2009, the Sensex had returned 73%, while Hero Honda had appreciated by 106%. When do you foresee the broader market returning to over 20% earnings growth rates? While we have marginally downgraded our Sensex EPS estimate for 2009-10 from Rs 886 in March 2009 to Rs 874, we have upgraded our Sensex EPS estimate for 2010-11 by 12.5% from Rs 980 in March 2009 to Rs 1,103. From 1996 to 2002, we saw a six-year earnings growth holiday, followed by a six-year phase of 23% earnings CAGR. It is possible that 2008-10 marks the period of consolidation for Indian corporate earnings. The 2010-11 earnings growth reflects early signs of recovery in the domestic economy. Which stocks/sectors are good bets from a perspective of two-three years? The sectors and stocks that can be considered include: Financials: This sector is expected to outperform the broader markets significantly. SBI and ICICI Bank are our top bets; we are underweight on the HDFC group. Auto: This is among the best performing sectors yearto-date. We continue to be overweight due to sustained volume growth driven by higher per capita income and greater availability of finance. We prefer two-wheelers to four-wheelers, with Hero Honda as our top pick. Among four-wheelers, we prefer M&M and Maruti. Engineering & construction: The Indian government is expected to sustain its ongoing thrust on infrastructure, including roads, power and urban development. We expect long-term, non-linear growth in companies that leverage this and recommend the theme, especially L&T and Jai Prakash Associates. Cement: This is a play on the boom in infrastructure and housing. We recommend buying into the scepticism about near-term over-capacity as valuations provide adequate cushion against earnings decline. We like Grasim, which is trading at over 50% discount to the Sensex.